Hay and livestock producers want to know if they can overseed their rhizoma peanut fields with cool-season forages during rhizoma perennial peanut dormancy. 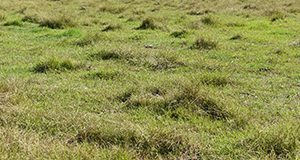 This new 5-page document discusses overseeding for hay and overseeding for grazing. Written by Jose Dubeux, Cheryl Mackowiak, Ann Blount, David Wright, and Luana Dantas, and published by the UF/IFAS Agronomy Department, January 2019. Beef cattle producers in Florida have expressed concerns about the potential presence of mycotoxins in summer perennial forages. In other regions of the US, mycotoxins in forage crops have caused productivity and economic losses. This 3-page fact sheet provides information about the current state of knowledge regarding mycotoxins in Florida perennial grass pastures. Written by Marcelo Wallau, Brittany Justesen, Ann Blount, Luiz Ferraretto, Glen Aiken, and Aaron Stam, and published by the UF/IFAS Agronomy Department, August 2018. Nitrogen (N) is one of the major off-farm inputs in livestock systems, either in the form of N fertilizer or purchased feed. Fortunately, you can reduce those expenses by growing your own nitrogen using forage legumes. Rhizoma perennial peanut (RPP) is a legume adapted to the Florida environment that grows well in mixtures with bahiagrass. This 4-page fact sheet discusses varieties, establishment, weed management, grazing management, and the cost-share program. Written by Jose Dubeux, Lynn Sollenberger, Joao Vendramini, Marcelo Wallau, Ann Blount, Liza Garcia-Jimenez, Erick Santos, and David Jaramillo, and published by the UF/IFAS Agronomy Department, July 2018.
and bermudagrass. Since it is less palatable, it can eventually dominate a perennial grass pasture. Brunswickgrass has become naturalized and has reportedly contaminated bahiagrass seed fields and pastures in the southeastern states, including some of the important counties for seed production in Florida, such as Gilchrist, Levy, Alachua, Citrus, and Sumter. This 4-page fact sheet provides an overview of brunswickgrass and discusses its appearance, variety/germplasm, and management. Written by Ann Blount, Marcelo Wallau, Brent Sellers, Dennis Hancock, Leanne Dillard, Jose Dubeux, Cheryl Mackowiak, Joao Vendramini, and Clay Cooper, and published by the UF/IFAS Agronomy Department, April 2018. Temporary Food Plot Deterrents for Deer: Do They Work? Many Floridians enjoy the opportunity to hunt, watch, or photograph white-tailed deer. 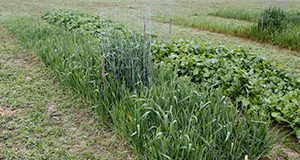 Hunters and landowners often plant cool season forage plots both to attract wildlife and to provide a dependable food source. But where there is a high deer population or scarce food resources, deer may forage on food plots as soon as the plants emerge and before they become established. 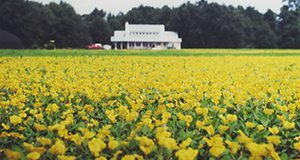 This fact sheet presents the results of research conducted at the UF/IFAS North Florida Research and Education Center in Quincy into the effectiveness of various strategies hunters and landowners can use to temporarily limit access to new food plots until the plants are well established and strong enough to attract and sustain hungry deer through the winter. Written by Holly Ober, Cheryl Mackowiak, and Ann Blount and published by the UF/IFAS Department of Wildlife Ecology and Conservation. 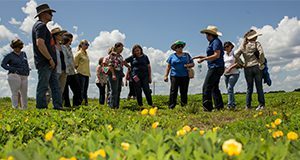 High-quality forage legumes that can be grown during the warm-season are scarce in Florida and the Gulf Coast region. Seeded warm-season legumes, such as cowpea, soybean, and pigeonpea, are less expensive and faster to establish than perennial peanut, and they could provide nutritious forage to complement beef cattle and other ruminant animal feeding programs. This 5-page fact sheet summarizes the results of three years of field trials and two feeding trials conducted at North Florida Research and Education Center in Marianna, located in northwest Florida. Written by Jamie Foster, Robert Myer, A.T. Adesogan, Jeffery Carter, Lynn Sollenberger, and Ann Blount, and published by the UF Department of Animal Science, January 2011. 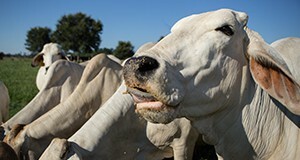 AN243, a 4-page fact sheet by Bob Myer, Lee McDowell, Cheryl Mackowiak, and Ann Blount, discusses the concentrations of forage minerals in bahiagrass pastures for beef cattle, to determine adequate mineral levels and use of mineral supplements. Includes references. Published by the UF Department of Animal Science, July 2010.